The Week in iOS App: Hail Halo! Maybe the last thing you want to fuss with when you’re trying to put together a to-do list is the list itself. That’s why Apple’s Reminders app works for so many; you can easily create lists, set notifications, and check off items. That’s about it. The free version of Any.do 3 has similar features plus a few more, and it offers a different UI treatment that you might find more pleasing, if such things matter to you. Any.do's day list. There's also a standard list, and a priority list. When you first launch Any.do, there are four default lists set up for you, but you can easily change the names of these. Adding another list just takes a simple click of the “+” box. Besides the UI, what differentiates the free version of Any.do from Reminders are the three list views: a day view that displays your list based on what you need to do on that day or upcoming days; a standard list; and a priority view. 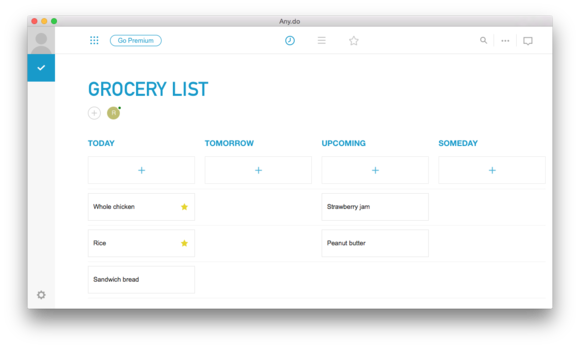 Your lists can be displayed in each view, so even your grocery list can be seen in the day view, which, at first, may not make sense at all. But actually, I found it handy—I put a grocery list that I need for the weekend in the Upcoming section of the day view, for example. Another differentiator: Click on an item in a list, and you can add a note, create a sub-task, add an attachment (1.5MB limit), or email the item to someone. The OS X app can sync with the Any.do iOS app, but the OS X app and the web version are missing the Moment feature. Moment is a quick way to see and manage your task list for the day. It’s a key feature on the iOS app so you don’t have to navigate through the app for your daily tasks. It’s not so much of a hassle to sift though your lists on the OS X and web versions, though it’ll be a welcomed feature when it’s available. The free version limits your access to Moment to only five times a month anyway, so if you don’t want to pay, you’ll eventually need to live without it, regardless. The items on your list can hold notes, subtasks, and attachements. If you opt for the premium version ($3 per month or $27 per year), you get a few more features. You get more flexibility when scheduling reoccurring tasks, unlimited task sharing, a 100MB file attachment limit, location-based reminders, multiple themes, and unlimited Moments. The different list views make the free version of Any.do better at organizing your task list than Reminders. And the ability to create subtasks, and add notes and attachments is handy. The premium version of Any.do has features that’ll make you seriously consider using it over Reminders, but you have to be willing to pay for it on a regular basis. If you want a few more organizational feature than what Reminders offers, Any.do may have what you need.